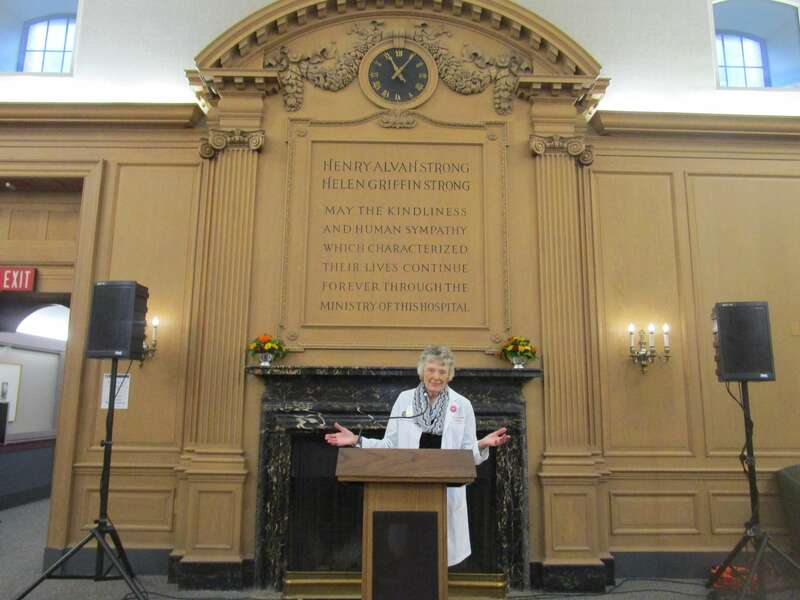 Over the summer, in In search of Julie Andrews at the George Hoyt Whipple Museum I introduced you to Dr. Ruth Lawrence, URMS ’49 and now Professor of Pediatrics and Obstetrics and Gynecology. 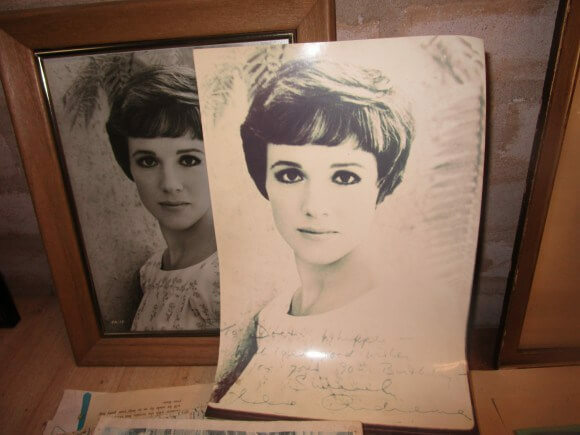 Then, Ruth meditated on the mystery of the signed photograph of Julie Andrews on Dr. Whipple’s desk. Ruth also invited me to her Meliora Weekend “Heritage Trail” tour of places of historical interest in the Center: the Whipple Museum, the Miner Library, Whipple Auditorium and the now decades old mail boxes. But, despite robust attendance last year, scandalously, the tour was cancelled. Instead, Ruth kindly offered a personal tour. As we had already covered the Museum, the first stop was Miner. Ruth explained that for Whipple the library was the heart of a medical school and therefore should be located at the very center of the complex. I wondered if by “heart” Whipple was metaphorically suggesting passion or feeling. Probably not as Whipple saw science as primarily a cerebral calling (Julie Andrews aside) and kept his analogies on the literal side. In the attractively stolid reading room, I took a picture of Ruth in a wish-I-knew pose. Always good humored, Ruth realizes not even doctors have all the answers. 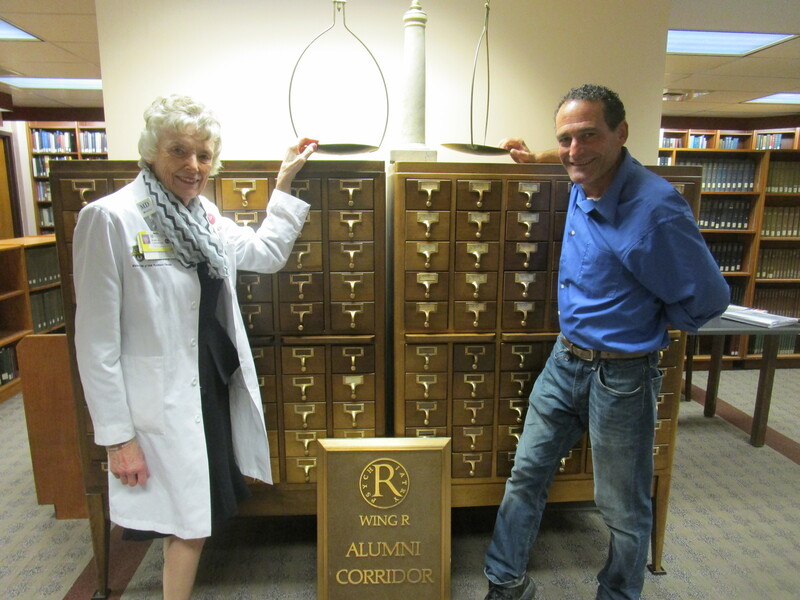 We also had a shot taken in front of the now antiquated card catalogue which holds a weight scale. We called our portrait, Life in Balance. At ninety years of age and still practicing, Ruth must know something about balance. You can also see an old plaque from the Psychiatric Ward, Wing R. Not quite there yet, but if so, look for a post. Next were the antique mail boxes still used on occasion by the medical students. Ruth points to hers from ’45 – ’49, the second one down as her maiden name was Anderson. In her day before email and texts, the mailboxes were often twice daily destinations, especially anticipated when stuffed with a blue envelope from the Dean’s Office bearing either bad or good news. 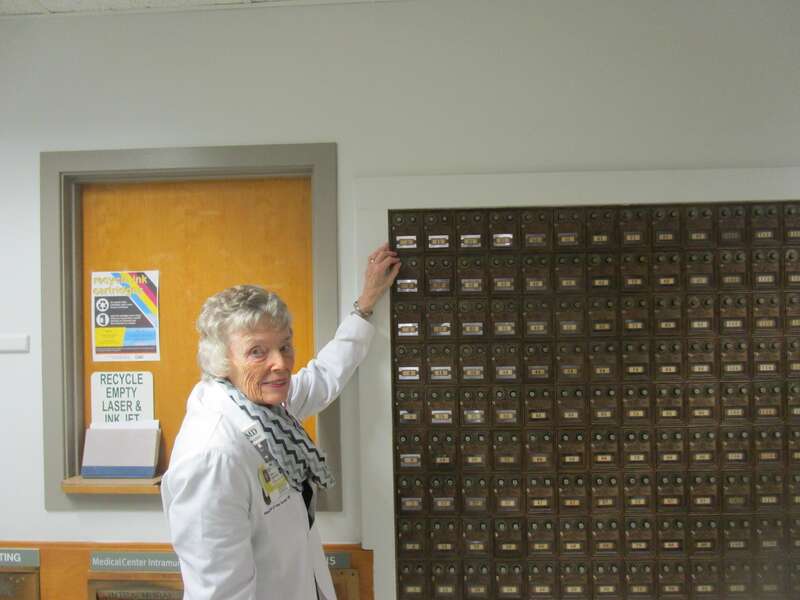 Despite the drama of the blue envelopes, as the communications center, Ruth casts the mailboxes not as the heart but as the “brain” of the school. Finally was Whipple Auditorium. Ruth distinctly remembers her first day of class, September 28th, 1945, when the whole class gathered under the gaze of Whipple and his colleagues. On every September 28th, Ruth sends classmates an email reminder. 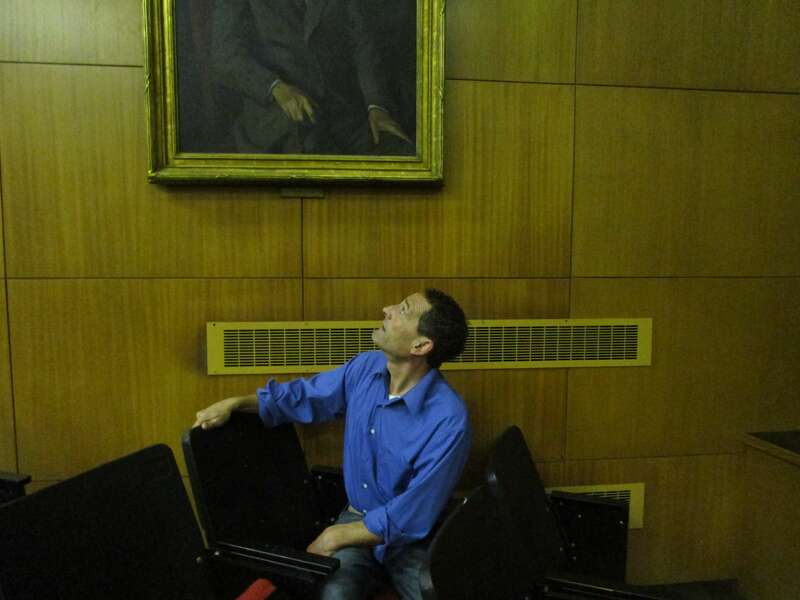 Ruth took the picture of me looking up at Whipple. You can’t see his face, but when I entered the seat his expression changed from serene to quizzical. We determined the Auditorium–a chapel of science–is the soul of the Medical School. One place in the Center is, unfortunately, gone. The old cafeteria — the stomach. In the good old days, students lived in dorms; eating together was a bonding break from chemistry and, yes, cadavers. Now most people live and cook in apartments or eat out in College Town. 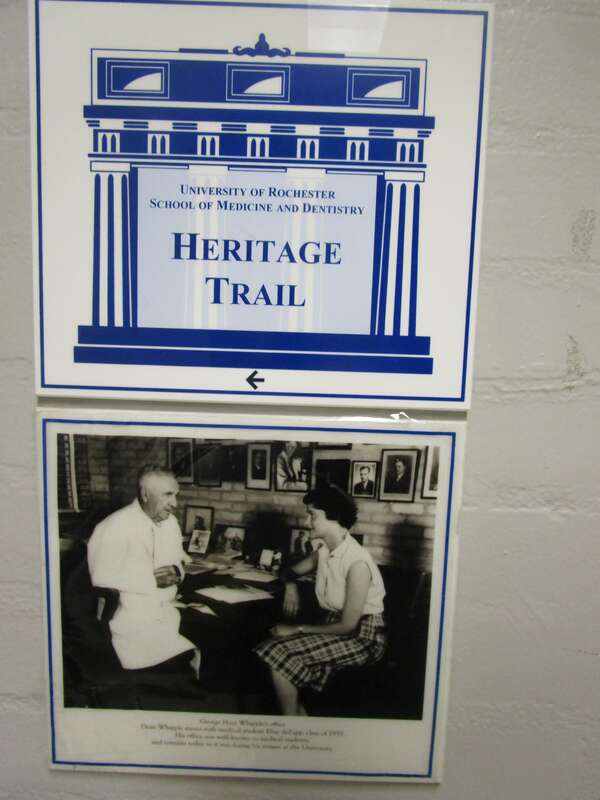 The URMC has certainly changed since Whipple died in 1976 even if his office never has. But in always used Miner–the heart–and in Whipple Auditorium when filled–the soul–a sense of camaraderie persists. And why alums back for Meliora Weekend enjoy Ruth’s tour. NOTE: We were hoping to include a photo of Ruth when nearing graduation in 1949. Whipple did not approve of traditional yearbooks, seeing them as a pretentious display. One professor, however, made portraits of each graduate in a fitting setting. Fittingly, given her career in pediatrics, Ruth’s was in the nursery. She can’t yet find the old packet of photos and her flight leaves at 6am on Saturday. But when she returns, and if she finds the packet, I’ll add. So revisit. Just the facts. On Alex White's robust campaign (and Adam McFadden's tardiness).